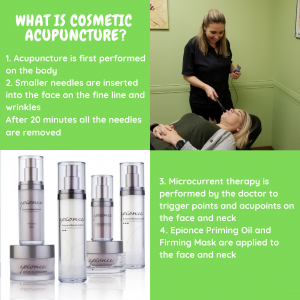 Cosmetic Acupuncture- The natural way to reduce wrinkles! Cosmetic acupuncture is also known as acupuncture facial rejuvenation. It’s the use of traditional acupuncture to slow the signs of aging in your face, tune up your skin, and to bring back that youthful glow to your cheeks. Cosmetic Acupuncture is a great alternative to or support of Botox or surgery. It promotes overall health supporting skin tone and brightness of eyes and skin. It increases your circulation to your face which prevents fine lines and wrinkles and improves skin tone. It stimulates muscls in your face and neck to send collagen and elastin which may reduce the appearance of fine lines and wrinkles. Most patients look younger and refreshed after just one treatment and get longer term results with multiple treatments. The practitioner will return to the room to remove the needles. After the needles are removed, the microcurrent facial massage begins. *This device will not be used on pregnant patients or those who have a pacemaker. The gentle impulses that are applied to acupuncture points located on the face can reinforce the benefits of the needles promoting well-being and relaxation. Microcurrent impulses stimulate and relax many facial muscle groups for improved smoother tighter looking skin. It can stimulate the body’s own resources for collagen and elastin.